A great wedding is often enhanced by special ceremonies within the ceremony. A popular favorite is a Unity Candle Ceremony. More and more I am seeing Sand Ceremonies, Wine Ceremonies, Hand-Fasting Ceremonies, Rose Ceremonies, even “Jumping-the-Broom” ceremonies. Some stem from various cultural traditions, others have symbolism that resonate well with what the couples feel for each other and for their marriage, and can add a touch of that little something extra, which makes the wedding even more beautiful and more memorable. A word of caution, however: If you’re going to include additional ceremonies, be sure to arrange for whatever accessories are needed! If you’re doing a Unity Candle Ceremony, order a set from a bridal shop that comes with everything – a pillar candle, two tapers, and all three holders. If you prefer not to go with a ready-made Unity Candle set, get candle holders that are sturdy and unlikely to tip over. And just in case a candle does tip over and fall, it might be a good idea to bring a spare or two – I’ve seen tapers break after being dropped. It can also be very symbolic if the pillar is taller than the tapers, as the greater height of the center candle depicts the belief that together the couple can become more than either could alone. Also, if you’re going to do a Unity Candle Ceremony outside, rest assured that there’s a 90% chance that the simplest breeze will blow the candles out. A good option might be to invest in hurricane shields to keep the flames going. Just be sure that they are easy to maneuver, as you’ll be using the tapers to light the pillar. Frans Candles has some great options to choose from! Also be sure to have a really good, strong, well-fueled candle lighter, and make sure it’s easy for your mother (or whomever is lighting the tapers) to use. Many lighters have a complex safety lock that’s great for preventing Little Johnny from burning down the house, but it might also prevent dear old Mom from lighting your taper! If you’re doing a Rose Ceremony, be sure to order roses from your florist – as well as the baskets and rose pedals for the flower girl! If you’re doing a Sand Ceremony, think about creative ways you can use different colored sand. If you and/or your betrothed already have children, different colored sand can be a wonderful way to include them, creating a decoration that reflects the entire family, not just the bride and groom. This entry was posted in Uncategorized and tagged advice, bride, brides, ceremony, groom, grooms, help, helpful, hints, interfaith, New Jersey, NJ, tips, wedding, weddings on June 24, 2013 by Brian Jude. When I launched my web site, I wasn’t sure if I’d include a blog. I didn’t know just what I’d include that doesn’t already get posted on Facebook or Twitter. Strangely, a few ideas popped into my head this week – some helpful hints that I’ll be sharing, “Another Happy Couple” stories that expand beyond my usual congratulations, other happenings, updates, offers and, well, whatever seems appropriate to share! So for today, I’ll start with some updates & happenings! Jen set me up with an account on VistaPrint, which offered me sweet a deal on business cards, so I ordered some of them as well, and they came in today too! The timing was PERFECT, as I needed to mail these materials today to the awesome Marni Gold for the Women in Weddings Conference, as I am a Swag Bag Sponsor! I’m very grateful to have my services advertised to women in the Tri-State Area who work in the wedding industry, from newbies to veterans! Well, that’s it for now. I look forward to blogging my next post soon! 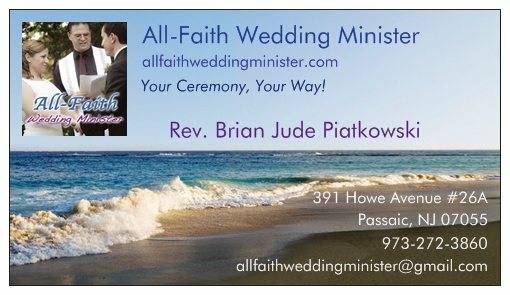 This entry was posted in Uncategorized and tagged advice, bride, brides, ceremony, groom, grooms, help, helpful, hints, interfaith, New Jersey, NJ, tips, wedding, weddings on June 5, 2013 by Brian Jude.